Hi y'all. I'm so delighted today to introduce, and do a quick quizzing, of a new stable mate. That's what I call it when my author has a new series coming out. But to make it really confusing, my author Erika, will be writing this series as Linda Wiken, which by the way, is her real name. 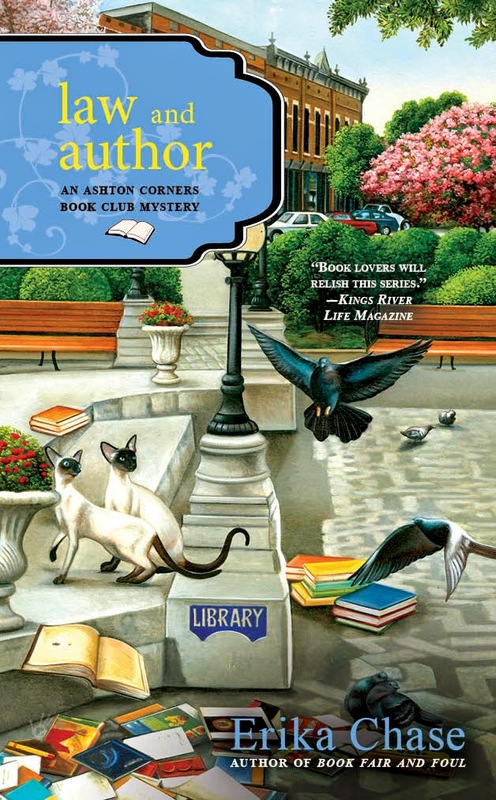 The series is the Dinner Club Mysteries and here's her main gal, J.J. Tanner to tell us all about it. Erika: Welcome, J.J. A dinner club series sounds real taste-tempting. Is it? J.J.: Well, if you like cookbooks, recipes and talk about food, then yes, it is! I'll tell you a bit about it. The Culinary Capers Dinner Club meets once a month and we rotate homes.The host gets to choose a real cookbook and from it, the entree while the remaining four members choose a side dish or dessert to go with it. And of course, we get to be pretty good at solving murders, too. Because there's always one of those. Erika: And, are there recipes? J.J.: For sure. And I promise, no poisons are ever used in the recipes or as a murder weapon! Erika: Where is it set? J.J.: Well, I live in the suburbs of Burlington, VT is a small (author's note -- fictitious) village of Half Moon Bay, right on the shores of beautiful Lake Champlain. Erika: And what do you do, besides catch killers, I mean? J.J.: So glad you asked. I'm an event planner. Anything special coming up? I'd love to help. Erika: Ahem, we'll have to see. One final question, what does J.J. stand for? J.J.: Oh, my...look at the time. Gotta run! Thanks for the chat, Erika. 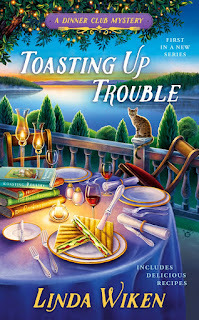 (If you'd like to win a copy of Toasting Up Trouble when it comes out in July, just leave a comment along with your email address before midnight, Wed. June 1st. I'll make the draw and contact the winner. I have it pre-ordered but sure would love to win. A new series to delight in. Welcome to both, er, all of you. Indeed a great setting. When we were in high school, a friend and I once sailed halfway across Lake Champlain in a sunfish, and we were stopped by whichever agency looks after the lake. They asked if we were all right. We assured them we were fine, and turned around and sailed back to shore. I love looking at the map and pointing "we were there!" suefoster109@netzero.net. I love food cozies. I visited Lake Champlain as a child and can't wait to revisit it in a new series. Thanks for the chance to win. Really looking forward to reading this one. Love the title and the cover! Really look forward to new series when they are released. 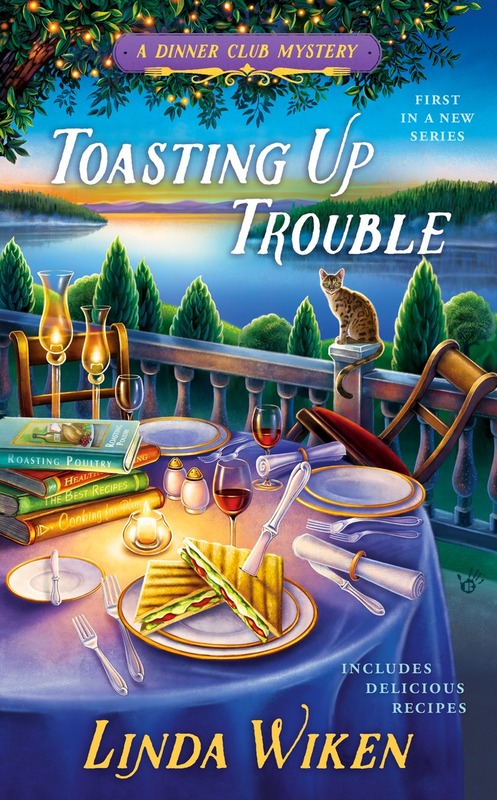 Would like to read "Toasting Up Trouble" when it's released. Thanks for the chance. New series! New author!! Great post. Love the intro. Love the covers. All on my TBR. But hoping for an early start. Thanks for the heads up. I get confused by authors using multiple names, too. Thanks for the contest. Sounds like a very tempting read. Looking forward to it. I love this...a dinner club? I'll toast to that! 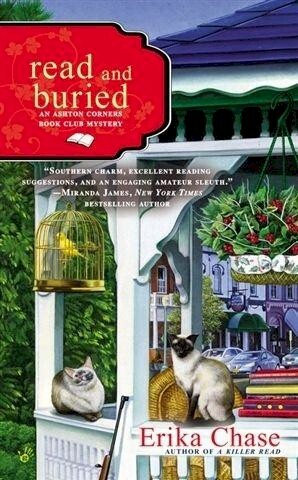 I am so glad I can find new-to-me books, and finding a fave author has a pen name. I'm really looking forward to reading this! It sounds good! Thank you! 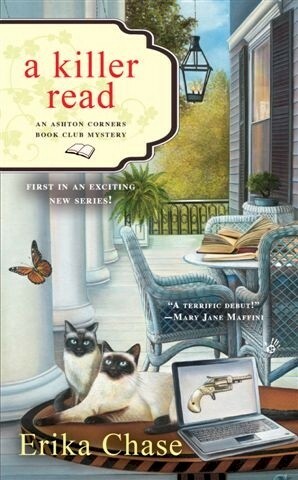 I really like the Ashton Corner Book club mysteries. 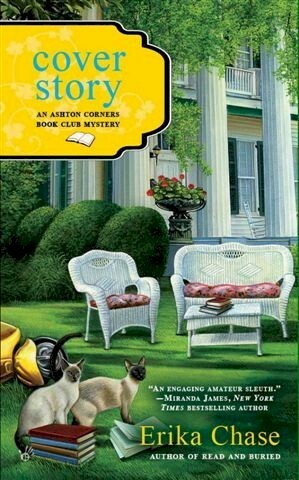 I am very intrigued by this new series and would love to win a copy! A great post thank you & I am loving this cover. Dinner Club Mysteries sounds like a great new series. Thank you for the chance to win a copy of Toasting Up Trouble. Well I just love all of the books written by Erika Chase. So, I know I should enjoy the books written by Linda Wiken, since they are the same person. I hope I win. I am interested in this new series! Thank you for the introduction and the chance to win a copy of the book! Thank you for the chance to read an amazing book. Thank you for the chance. Sounds delightfully fun!!!!!! Wow, I could use an event planner. The book sounds greeat. Sounds great, I would love to read it. Thanks for the chance! I love it when a new series comes out! I loved the interview! Really enjoy these cozies. Thanks for this opportunity. But its got me thinking, just what JJ stands for. Hummmm.